The Ford Fiesta offers colors galore for both the interior and exterior, including 10 exterior colors and seven interior colors. 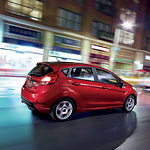 The metallic-painted accents add a special touch of class to the Fiesta. The tech-friendly console not only looks great but also offers you convenient access to your devices. The interior offers only the smoothest and softest fabrics. Some things you just have to see to believe, and this is the case with the Ford Fiesta, so come to our Ford dealership and take the new Fiesta out for a test drive.